First up, what’s a logline? Well, a logline is a 1-2 sentence blurb that describes a film. That’s it. They’re used a lot in script coverage, in film festivals, on marketing materials, you name it. If you can’t distill your movie down to two sentences (or fewer) and make it sound interesting, you probably don’t have an interesting movie. A town is terrorized by a monster. Now doesn’t that just bring back the memories? Such a great movie, but the logline isn’t doing the movie much justice. While, technically, the example functions as a logline in that it’s a one-sentence synopsis, the absence of an important element keeps it from achieving logline self-actualization. That missing element? But tension comes from knowing the stakes. Who’s in the film? What are they trying to do? What happens if they fail? So how are you supposed to jam stakes into a logline, when you only have 1-2 sentences to work with? But how do you jam tension into such a small bit of text? Easy. Set up the who, set up what they’re up against, and tell us what happens if they fail. A police chief with a fear of the ocean battles a gigantic shark terrorizing a beach community. Who: The police chief. What he’s up against: giant shark. What happens if he fails: Shark eats beach community. The bare minimum of a good logline: telling the audience what the movie’s about in a way that renders for the reader of the logline a good idea of what’s at stake. But all good loglines also contain some sort of irony as well. A seaside town is terrorized by a giant shark. It’s perfect, right? We covered everything in the movie. There’s a seaside town. There’s a giant shark. There’s terror. Yup, we got it, mission accomplished. Martini shot. It’s safe to go back into the water. Just kidding! Okay, so it’s not a perfect logline yet but we’re making solid improvements especially with the addition of irony, but why does irony matter? Because narratives are about change, screenplays whose loglines contain a high amount of irony tend to offer the largest room for narrative growth. Irony plays into our sense of justice too. With great power, comes great responsibility for retaining franchise rights. Along with Spider-man, what every professional screenwriter knows is that the best movies aren’t about only good or only bad moments. Balance is essential. Rise and fall or fall and rise or fall and spring or winter and summer or construction season, you get the point. Irony provides the give-and-take necessary for a good story idea to become a great film. 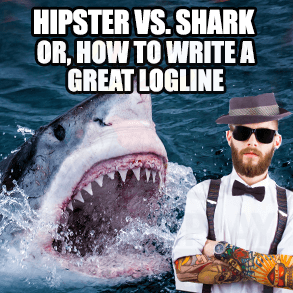 Let’s look at another example of a movie we’ve just made up called HIPSTER VS SHARK. A hipster who’s afraid of water wins tickets for his favorite band’s cruise ship tour. In this example, there’s a central character with a problem that he needs to overcome in order to achieve his goal. The irony at work here grants the character room to grow from where he began. Without this necessary space to develop, the character might not have much of an arc and the narrative could suffer because of it. Who wants to fund a movie about a character that doesn’t change or an event where nothing happens? The other job irony is doing in this logline is providing balance to the character’s fortune. This balance is necessary to maintain plausibility and help the audience suspend disbelief. Often confused for irony, coincidence is a double-edged sword when it comes to creating the plot. When used poorly, coincidence can make the plot feel too convenient. Typically, we find misfortune to be far more plausible than being lucky. In our example, the hipster’s good fortune of winning the tickets is balanced by his misfortune of being afraid of the water. Hipsters may do things ironically but there’s no such thing as ironic shark fishing. Although in our case, we’re not fishing for sharks. We’re fishing for a producer, agent, director, or anybody with connections to get our screenplay to the next level. With the right application of irony to our loglines, we can be sure to reel in our catch.